Prime Minister Justin Trudeau speaks at the Canadian Transformational Infrastructure Summit and the Canlnfra Challenge in Toronto on Tuesday May 29, 2018. The Trudeau government is taking an extraordinary step in its push to ship more oil sands crude to global markets and will buy the Trans Mountain pipeline from Kinder Morgan for $4.5-billion after the company lost interest in an expansion project beset by fierce opposition from environmentalists, Indigenous groups and the B.C. government. This move – which amounts to a nationalization of what Ottawa considers a critical-infrastructure project – came after Kinder Morgan signalled it wanted to walk away from plans to expand the existing pipeline between Edmonton and Burnaby, B.C., even though the Liberal cabinet had earlier offered to indemnify it against financial losses. It is the largest federal government intervention since 2009, when Ottawa joined the Ontario government to advance more than $13.3-billion to help keep Chrysler and General Motors afloat. Back then, however, a larger financial crisis was playing out. The Liberal government has become a champion of the Trans Mountain expansion to back the policy objective of diversifying oil markets beyond the United States – where 99 per cent of Canadian crude exports currently go. Oil producers in Canada are paid less for their product than other crude producers, in part because bitumen production is increasing beyond pipeline capacity. 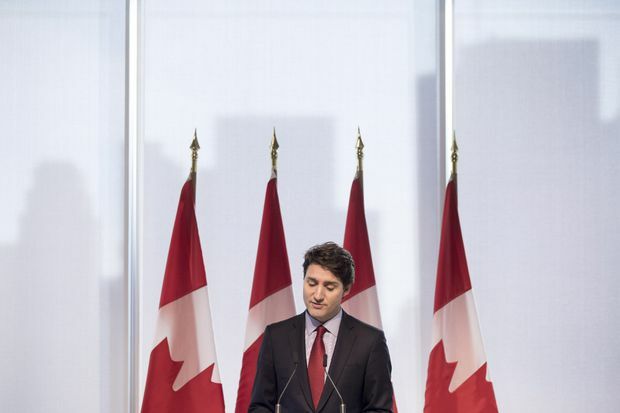 Ottawa’s intervention does not secure the future of the Trans Mountain expansion project, however, and the total financial commitment for taxpayers could far exceed $4.5-billion. The federal government will have to find money to finance construction, the cost of which has already been estimated at $7.4-billion. Finance Minister Bill Morneau refused to reveal how much taxpayers will have to pay to complete the 980-kilometre expansion, which would triple the flow of crude and refined oil products to 890,000 barrels per day. Keeping it alive sustains 15,000 jobs, the Finance Department said. Prime Minister Justin Trudeau said the hazards of building this pipeline drove away Kinder Morgan. “The project became too risky for a commercial entity to go forward with it; that’s what Kinder Morgan told us,” he said in an interview with Bloomberg. It is not clear how Ottawa’s purchase will help the project navigate legal challenges or B.C.’s threat to restrict oil shipments through its jurisdiction. The federal Court of Appeal is considering 15 consolidated challenges to the federal approvals of the project and could render a decision any day or accept an application to reopen the case to hear new evidence. The transaction with Kinder Morgan will not be complete until August and, in the weeks ahead, the company will try to help the federal government find a private buyer. The pipeline assets will be held by the Canada Development Investment Corp., a Crown corporation that reports to Parliament through the Minister of Finance. The government said it does not want to be a long-term owner of the pipeline. “At the appropriate time, Canada will work with investors to transfer the project and related assets to a new owner or owners,” Mr. Morneau said. He acknowledged that Ottawa could own Trans Mountain for as long as the “medium term” – a time period he did not explain. Tuesday’s announcement ensures work can resume on the expansion. In April, after mounting opposition from the B.C. government, Kinder Morgan halted all non-essential spending on it. Kinder Morgan will operate the expansion project until the sale closes in August. Officials in the Department of Finance said Ottawa is extending loan guarantees to the company that allow it to draw on a line of credit and begin summer construction. As an incentive for a future owner, Ottawa said it will indemnify the project against financial losses from any delays thrown up by a province or municipality. The government is also promising to guarantee a rate of return for a future owner if it is forced to abandon the project owing to legal rulings or other delays. Mr. Morneau said the government reserves the right to buy back the pipeline project in such a scenario. “To investors who are considering Canada as a place to build big important transformational projects like the Trans Mountain − know you have a partner in Ottawa,” Mr. Morneau said. Oil sands producers welcomed the federal acquisition, albeit warily. Cenovus Energy Inc. chief executive Alex Pourbaix said roadblocks in British Columbia need to be addressed quickly. “In addition, as a committed shipper on the project, we will be looking for more details to ensure that our commercial terms will remain reasonable,” he said in a statement. The Alberta government is investing up to $2-billion for what Ottawa called an emergency fund in case of unforeseen circumstances. Alberta said the province in return would be granted an equity stake in Trans Mountain. Conservative Leader Andrew Scheer slammed Mr. Trudeau over the decision to buy the pipeline, saying it never had to come to this. Employees on the pipeline expansion would stay with it, Steve Kean, president and chief executive of parent company Kinder Morgan Inc., told reporters. In Edmonton, Alberta Premier Rachel Notley said Alberta’s support helped bring about Tuesday’s announcement. Ms. Notley added that “Crown immunity” now limits the degree to which provincial laws apply to the project. Environmentalist Tzeporah Berman, who has helped co-ordinate key protest movements in B.C., expressed shock at the government’s decision. “People feel betrayed,” she said. “This is a Prime Minister who criticized the Harper government’s pipeline approval processes for not addressing Indigenous rights, for not taking climate change seriously, and not respecting science.